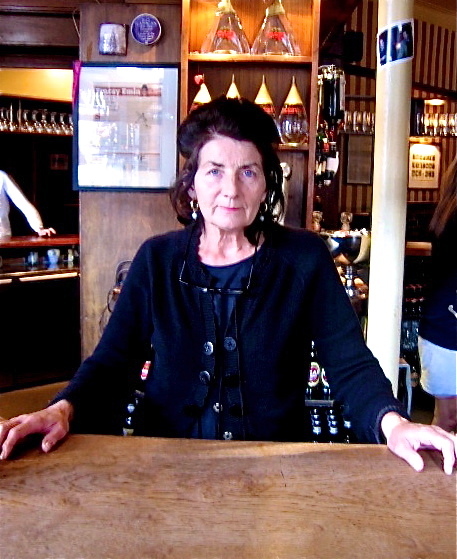 Everyone in the neighbourhood knows Sandra Esqulant, beloved landlady of the Golden Heart in Commercial Street, sometime hula-hoop dancer, darling of the contemporary art world and the uncrowned monarch of Spitalfields. Before taking this picture, I asked Sandra to “Show me the Manet” and my readers who are artistically inclined will recognise the pose from Bar at the Folies Bergere 1882. Born just round the corner in Wentworth Street, Sandra (with her recently deceased husband Dennis) has kept the Golden Heart for us since 1977, through the lean years and the good. If Spitalfields were a tall ship, with all the residents as its crew, we should have an effigy of Sandra hewn from oak as our figurehead and know that we could sail through all the vicissitudes of life’s great ocean with confidence, with her as our inspiration and spiritual guide. ‘Sandra … has kept the Golden Heart for us since 1977′. Not ‘ Sandra runs the Golden Heart’ or ‘Sandra is the landlady at the Golden Heart’. But she ‘keeps it for us’! She sounds magnificent, a wonderful homage. And I hope one day to be aboard that ship and sail the rough seas with you, Sandra proudly at the prow. 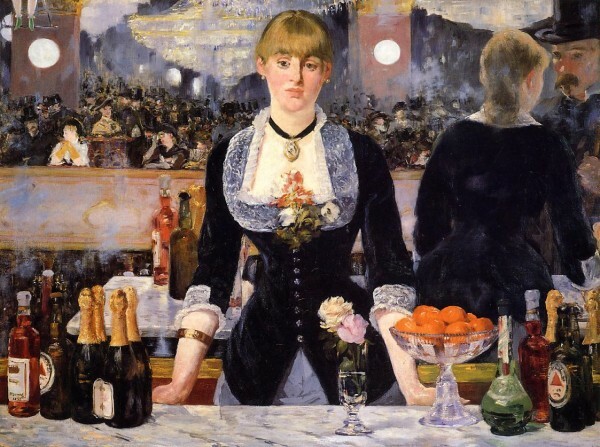 I love the comparison of photograph and painting – even Sandra’s expression is the same as the woman in the Manet. My wife and me will be visiting the Heart later this month when we’re in London on some course or other. The Golden Heart and the earlier Golden Harp on Vine Court (off Lamb Street according to court records) are they one and the same? Many thanks and keep writing your brilliant posts. But where’s the bottle of Bass?